Commonly known as a natural treatment of depression St John's Wort (botanical name hypericum perforatum) has many more joyous beneficial properties to celebrate. You see it contains an active ingredient called hypericin which has anti-inflammatory properties. It is believed to reduce eczema symptoms and soothe swollen areas or abrasions of the skin. It is perhaps for this that it can be used in its extract form as an ear drops for ear infections, ear pain, or tinnitus. 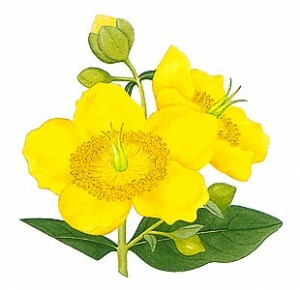 Also the chemical constituent hyperforin found in St John's Wort has antibacterial and antibiotic properties. Studies are being undertaken to measure how effective it inhibits a part of the brain that may alleviate the symptoms of attention ddeficit hyperactivity disorder (ADHD). But the herb that elevates serotonin and energy levels in the body is not without its side effects when taken internally. Dizziness, dry mouth and constipation are the main ones though these are far less extreme than standard pharmaceutical antidepressants and many studies have found just as effective for some types of depression. Two calming skin care products that contain St John's Wort are the Almond St John's Wort Body Oil by Dr.Hauschka and the Aaag! Herbal Bath Bags by Hedgerow Herbals for stress, sadness and tension.